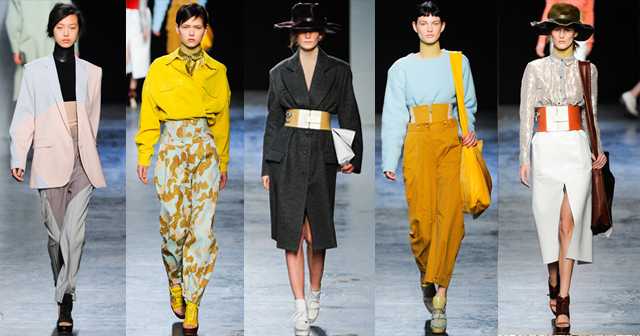 This is my last London Fashion Week post, I promise! I bet you’re all sick of the sight of these posts and probably know all the collections like the back of your hand after they’ve been all over the Blogosphere, but I couldn’t let these ones go without a mention. I loved the clash of masculine and feminine in this collection. The whole androgyny thing feels like it has been so over done, but this is a refreshing take on it. Acid chambray shirts, womanly silhouettes, pastel boyfriend blazers, figure hugging dresses and floral high waist trousers take it to a new level. This was a collection that I wasn’t excited about at all at first, but I was won over after only flicking through a few looks. Giles is always a show I look forward to as I always love his shapes and feminine pieces. This show reminded me almost of a masked ball, starting with a tuxedo and dramatic masked headgear, and cascading into beautiful dress after beautiful dress, sometimes even mixing the two together. 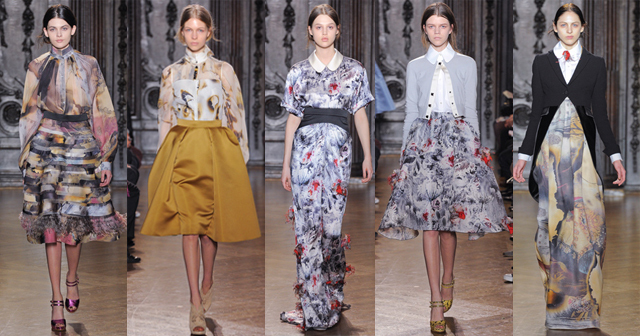 I loved the dreamy prints, and my favourite look was the full floral skirt with a very prim and proper collared shirt and jacket (2nd from right). The colours are just gorgeous! 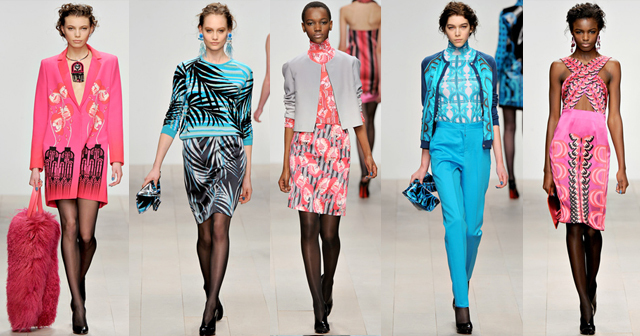 I’m not a massive wearer of brights but I would wear a lot of the pieces from Holly Fulton’s latest collection. I would wear the centre look in a heartbeat! I feel like it is wrong to like this collection in all it’s eye popping, print-tastic glory, but I just can’t help it. The only thing I didn’t really ‘get’ were the humungous fur bags, but each to their own! Also adore the bright blue trousers/blouse/jacket combo. One thing that Holly did that not a lot of others did, was use tights with her clothes. I think this was the right choice with this collection as the black really sets off the colours. Love Mary’s work so much lately. She is going from strength to strength, what with her collaboration with Topshop. I watched this collection live online and was really impressed with every single look. There were so many different silhouettes, with a big emphasis on peplums, and an array of textures. 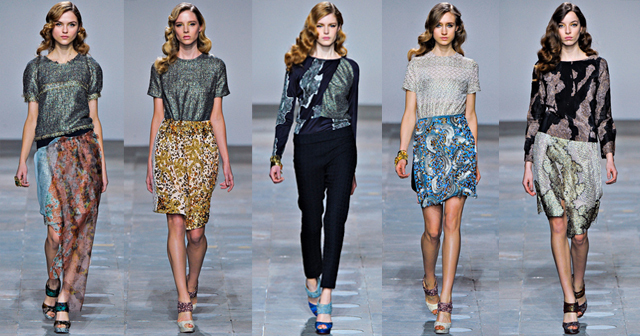 The prints ranged from geometric and almost robotic, to organic and flowing. My favourite piece in the show was the lilac polo neck dress with a flowing pink floral skirt (2nd from right). Such a beautiful shape and dreamy colour palette. This is a designer I’m not that familiar with, and looked at his collection out of interest. I’m really glad I did as this was another of my favourites. Very organic prints that seemed to blend into one another, even though they were all so different. Every look seemed effortless and I could see a lot of pieces working in a day to day wardrobe. Images from style.com and londonfashionweek.co.uk. So that’s it for A/W 2012, until it actually comes around! I’ve been really impressed with a lot of the shows this time around. My favourites though have to be Mulberry, Mary Katrantzou, Burberry, McQ and Moschino Cheap & Chic. All completely different but all really caught my eye and gave me some new ideas to inject into my wardrobe next winter. In other (exciting!) news, I have a little secret to share with you all! You may have seen on Twitter that I am taking a chance with a little business/blog venture, and trying my hand at jewellery making. I’ve always admired people who do it, but always from afar, but I’d love to give it a go. I’ll also be stocking other things such as rings etc, but I’ll be hand making some pieces, mainly necklaces to start off with. I’m just awaiting the arrival of all my supplies then I can get making in the next week! I’ve set up the shop site, aptly named Sitting Pretty Shop, so keep an eye on there for updates. If you have any requests for something you would like making, let me know I’ll see what I can do for you! Acne was one of my favourites. I really like the fact it's not too 'in your face'.